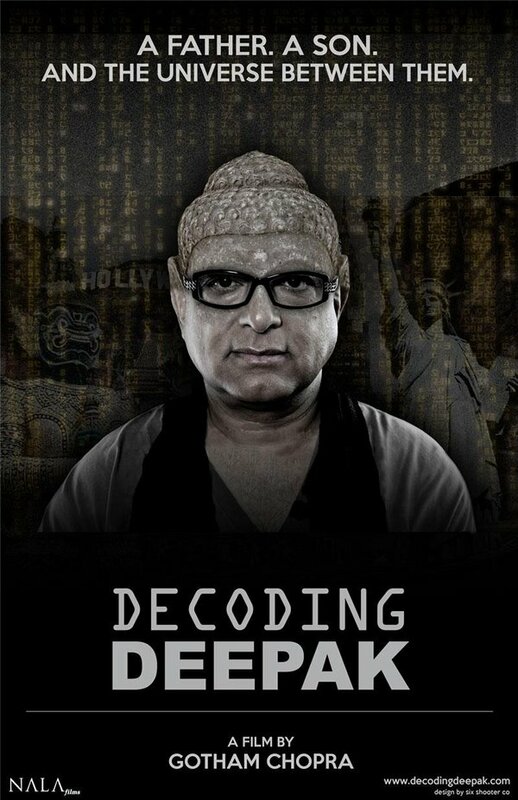 Check out the trailer to an excellent new documentary that premiered at SXSW this year: DECODING DEEPAK. I encourage you to see the film as chances are you know something about Deepak Chopra or have perhaps quoted one of his inspiring spiritual observations or insights. The film was made by Deepak’s son, Gotham Chopra, a friend and creative collaborator. Gotham is an author, journalist, screenwriter, director and producer. He also runs a comic book company. In short, he’s the epitome of a multi-platform Content Creator. There are some great themes explored in the documentary: father and son, life and death, legacy and calling, ego and drive, spirituality and humanity, detachment and family… all of which resonate on many levels in the style and tone of the piece. The film lifts the veil, deepening our gaze into the world of Deepak while providing a gentle, personal portrait of the man who is a guru to the masses, but also the filmmaker’s father. The doc provides honest, poignant and thoughtful insights all the more resonant since the questions posed to Deepak and the concepts the film contemplates come from his own son.